Following the triumph over Nazi Germany in 1945, the Red Army underwent a symbolic transition toward a more traditional representation of a state army and away from Communist ideology. This image shift began during the war with the reintroduction of epaulettes, a clear echo of old Russian army traditions. More was to follow. In 1946, fresh from its epic victory over Nazi Germany, the Red Army was renamed the Soviet Army. It was a symbolic step: No longer seen as the muscle of a theoretical future world Communist revolution, the army was now the concrete fighting arm of the full-fledged Soviet state. In 1945, Soviet generals were decked out in a new dress uniform, with a closed double-breasted jacket in blue-green, a color that was quickly nicknamed "royal" in reference to the jacket’s predecessor in the imperial army. The cuffs were embroidered in gold and silver, also a clear nod back to tsarist tradition. But a distinctive new feature was the detachable top button, which created more space for the many medals and awards that most Soviet military commanders had accumulated by the end of the war. The uniform of the lower ranks did not change much after 1945, however, since it had proved ideal in combat and gave no cause for meddling. Major dress overhauls began only after the death of Joseph Stalin in 1953, and was initiated by Marshal Georgy Zhukov, the new defense minister. Again, it was the senior ranks who were most affected. The traditional high closed-collared tunic was dropped in favor of an open cut. Under the jacket officers now wore a tie on a white shirt with collars embroidered with gold and silver laurel and oak leaves. The tie knot bore a metal star with insignia denoting high military rank. Officers were issued gold thread belts and ceremonial daggers, and their caps grew in size, with a larger flat crown and prominent metal badge with a red star set in golden ears of corn. The design remained unchanged to the last days of the Soviet armed forces and the emergence of new symbols of the modern Russian army. The field and casual officer’s uniform stayed much the same, with an improved version of the long-cut jacket. This item had the advantage that it could be worn for shooting in hot weather with just a shirt and khaki tie underneath. After the war, officers were more inclined to return to pre-revolutionary traditions featuring gold-embroidered uniform elements, which looked elegant and emphasized the officer's dignity. Then came the armed intervention in Hungary in 1956, when buttons and epaulettes reverted to khaki once again, for the same reason as on the previous occasion in WWII: The distant glimmers of gold trimming made fruitful targets for enemy snipers. Overall, the Soviet soldier still looked the same as he did in World War II, until the last major overhaul in 1969, when the soldier's shirt was finally retired, having served well since tsarist times. Its prohibitive deficiency in modern warfare, however, was that it had to be put on and removed over the head, which created health hazards in conditions of possible radioactive contamination. Troops started cutting their shirts down the center and they quickly turned to rags. Out went the shirt and in came the jacket blouse with buttons. But the forage cap, a constant symbol of the Red Army during the Second World War, was retained, as were the standard issue tarpaulin boots. 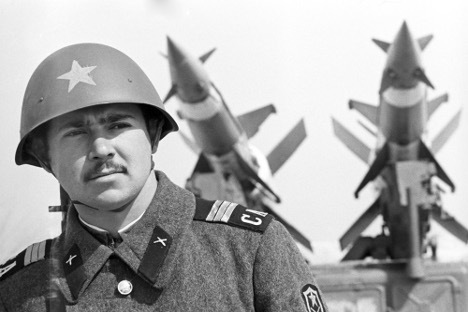 The uniform was made from cotton or wool blend fabrics, which suited the climatic conditions in the Soviet Union. A special lightweight uniform was developed for troops serving in the hot regions of Central Asia, including the distinctive rimmed panama hat instead of a cap, and shoes instead of boots. In 1969, airborne infantry units got the first telnyashka light cotton top with its distinctive horizontal blue and white stripes. Worn under a short jacket and with pants tucked into ankle boots, and with a beret, this outfit survived the demise of the Soviet Army and is worn largely unchanged by soldiers in the modern Russian Army.